Hey, do you remember how I decided I was going to start posting The Week in Bentos on Mondays from now on? 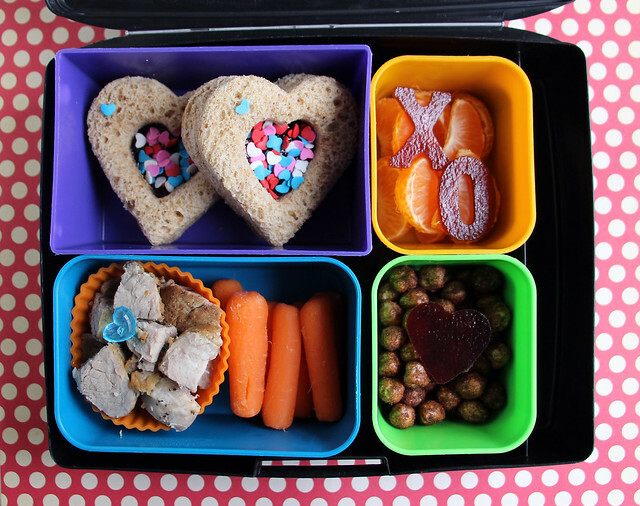 On Monday, I packed Wyatt this slightly Valentine-y Laptop Lunches bento. I added a few hearts so he could know I am thinking of him, but I kept them subtle enough that he could keep his reputation as a cool guy in the cafeteria. He had cheddar cheese squares, turkey pepperoni, a cheese heart (this is my favorite heart cutter and it comes from this set ), Triscuits, two mandarin oranges, and white cheddar popcorn with heart sprinkles on it. Augie was home with a fever so no bento for him. Tuesday Wyatt was excited to find mini-bagels in the cupboard and he asked for some in his lunch box. I filled a few with cream cheese and put them in a large Laptop Lunches container (from our Bento Buddies set) with a few mandarin oranges. 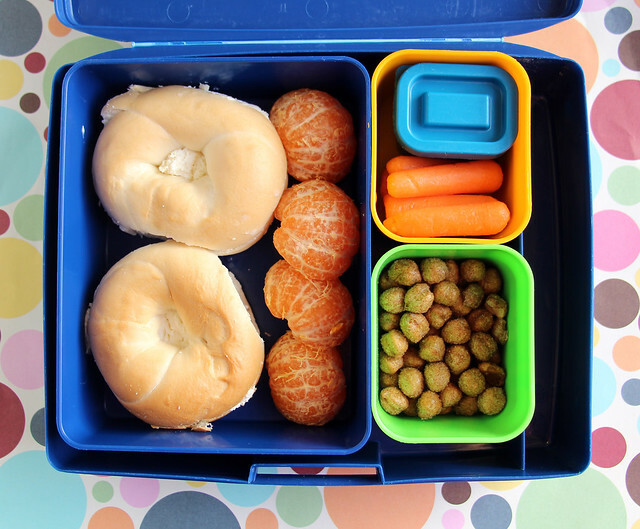 The rest of the lunch box held carrots and bean dip and some sweet cinnamon roasted chickpeas from The Good Bean. I sampled these chickpeas when I went to the Fancy Food Show last month and I was excited to have the boys try them too. They’ve been a moderate success. Wyatt ate the ones I put in his lunchbox but he was neutral when I asked him if he’d like me to pack them in the future. Augie has been much more excited about them and has asked to have them as his snack several times. Augie was home sick again. 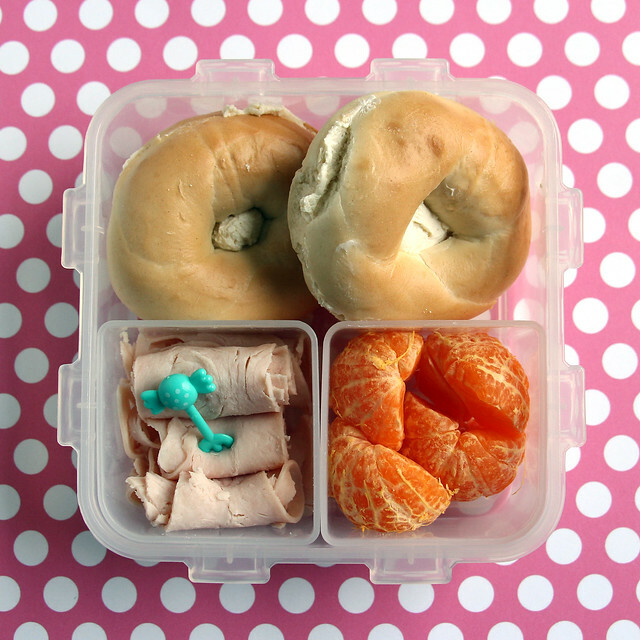 This is a great example of a super simple 5 minute bento. We were running very late on Wednesday morning — so late that I told Wyatt he was going to have to eat lunch at school. He was super bummed when I told him so I took pity on him and threw together a bento as quickly as I could. I gave him two mini bagels with cream cheese, a few turkey roll-ups with a candy pick and some mandarin oranges. It wasn’t fancy by any means, but it looked good and it was much tastier than the food he gets from the school cafeteria. This was packed in our Lock & Lock 4-up bento. Augie was home sick again. Poor buddy. On Thursday I wanted to step up the Valentine’s stuff a bit and Wyatt gave me permission to go for it. He had strawberry jam sandwiches with a heart cut out of the top slice of bread and sprinkles added to the hole. He also had leftover pork tenderloin, carrot sticks, chocolate roasted chickpeas (from The Good Bean) and mandarin orange wedges. I added a little extra decoration by cutting X-O and a heart from fruit leather too. This was packed in a Laptop Lunches box. My pal Venia from Organized Bites sent me a surprise package with some super hero cookie cutters in it on Wednesday and Augie was suuuuper excited to use them in his lunch on Thursday morning. This set was issued by Williams-Sonoma a few years back and I didn’t jump on them fast enough to get a set before they were discontinued. (They now sell on eBay for crazy prices.) Bento friends are the best, because they get me! In any case Augie wanted a superhero lunch and he wanted a Valentine’s day lunch and we decided to combine them. I think he explained it best: “They are friends and friends love each other and give each other Valentines. Right, Mom?” Right buddy! 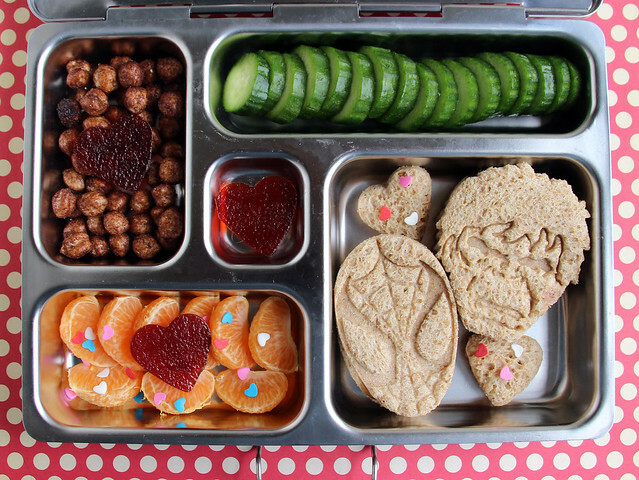 So we pulled out the PlanetBox Rover and packed this Best-Friends-Superhero-Valentine lunch: chocolate roasted chickpeas with a fruit leather heart , Persian cucumbers, mandarin oranges with another heart and sprinkles, Spiderman and Hulk PB&J sandwiches, and a few extra bread hearts decorated with more sprinkles. More hearts for Valentine’s day! Wyatt had a Laptop Lunch with mandarin oranges, popcorn with heart sprinkles, carrots and mini pizzas that I cut into heart shapes. 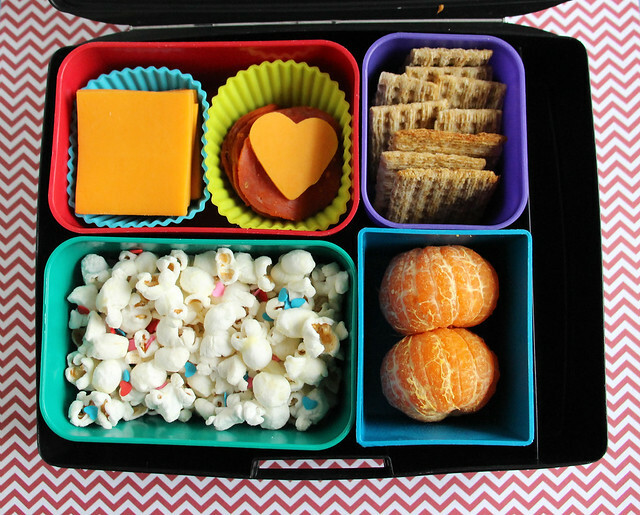 I packed Augie’s lunch in our Yubo box: a heart-shaped peanut butter and jelly with sprinkles in the cut-out, snap peas, carrots, cucumbers, mini heart pizzas, mandarin orange slices and popcorn with sprinkles.